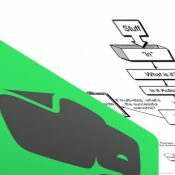 I read The Secret Weapon about how to use Evernote as a Gettings Things Done (GTD) facilitator. I tried the method, but found it too labor intensive. It requires too much shifting things around manually; adding and removing tags and the like. I’d rather have a system which takes care of itself as much as possible. Also, I didn’t need the full system that The Secret Weapon method uses. Instead, I’ve come up with a simpler system which requires less effort to manage. A major goal of this setup is to be able process the inbox in as few steps as possible. And all you need is two notebooks, three tags, and some saved searches. The concepts of the GTD system that we’re using here are inbox, next, scheduled, someday, waiting, and of course the reference file. One for Actions and one for Reference. The Actions notebook must be the default so that any new notes automatically go there. My system only requires three tags: #scheduled, #waiting, and #someday. Well, okay, technically the #waiting is a tag family made up of #waiting and nested tags with people’s names like #waiting-jason, #waiting-caleb, etc. However, just make those sub-tags as you need them. Trying to make the sub-tags with people’s names up front will just cause frustration and complicate the setup. These are the key to making the simple setup work for a GTD system. Inbox: notebook:"Action" -reminderOrder:* -tag:#scheduled -tag:#someday -tag:#waiting* This search returns every item in the Action notebook which has neither the #scheduled or the #someday tag, and does not have a reminder associated with it. In other words, items which you haven’t dealt with yet. Next: notebook:"Action" -tag:#scheduled -tag:#waiting* reminderOrder:* This returns everything in the Action notebook that has a reminder and does not have the #scheduled tag. If you wanted, you could also include -tag:#someday to ignore items in someday. Doing that, however, makes it so that in order to promote something from someday to next, you have to remove the #someday tag and add a reminder. That seems to be 2 steps where only 1 is necessary. Someday: notebook:Action tag:#someday -tag:#waiting* -reminderOrder:* This returns everything in Action notebook with no reminder and that has the #someday tag. As stated above, adding the part about “no reminder” allows you to promote items from someday to next by simply adding a reminder. (shortcut to Inbox saved search) Because of the way the search is setup, anything you haven’t added to one of the other areas will show up here. (shortcut to Next saved search) In order to add things to next just add a reminder. (shortcut to #scheduled tag) Adding the #scheduled tag to an item will move it to the scheduled section. Ideally, things in the scheduled should have a dated reminder associated with them so they come to your attention on the date, but this is not enforced in this setup. However, you could easily enough do that with another saved search for items with the #scheduled tag and also with a reminder. However, that could cause items to fall through the cracks if you tag it with #scheduled but forget to add a reminder. To promote scheduled items to next, ensure it has a reminder, then just remove the #scheduled tag. (shortcut to #waiting tag) Tag waiting items with waiting[hyphen][the name of the person you’re waiting for]. For example, if you’re waiting for Jason, add the tag #waiting-jason. One caveat to adding people’s names as tags: some systems like The Secret Weapon recommend adding people’s names as tags to all items which are associated with that person. I find that this gets overly complicated. I do however, think it can be handy to have items in the waiting section tagged with people so that I know who I’m waiting on. You can just create them as you need them. All of these #waiting-___ tags should be nested under a main #waiting tag. To simplify things, you could just use the main #waiting tag for everything you’re waiting on and forget the business with the sub-tags. To promote items to next, add a reminder and remove the #waiting-___ tag. (shortcut to Someday saved search) Items with the #someday tag and no reminder (and without the #waiting or #scheduled tags) show up here. move item to the Reference notebook. Do It: move item to next by adding a reminder (dated or not). Defer It: move item to scheduled by adding the #scheduled tag. Also add a dated reminder to bring the item to your attention at a specific time. Delegate It: move item to waiting by adding the #waiting-___ tag (and probably send the note to someone else). Some GTD implementations I’ve seen have a later concept. You can fairly easily add later to this system by adding a #later tag, and tweaking the searches as appropriate. This system doesn’t have a way to focus things. I’ve found that just doing what’s at the top of the next list works well enough for me, but you could add a more explicit focus concept by adding a ! tag and adding a search like notebook:”Action” tag:”!”. Then by adding the ! tag to an item (regardless of what area it’s in) things get focus and stay in their current location otherwise. I was pretty imesrsped myself. Brilliant. Do you do anything special to handle projects? Or do you simply treat as a compound action? Ideally, for large projects it would be perfect to make a notebook stack named “Projects” and create notebooks for individual project in that. However, there’s neither a way to conduct wildcard searches for notebooks, nor a way to search against a notebook stack. I like it. Are you still using it this way or have you made modifications?